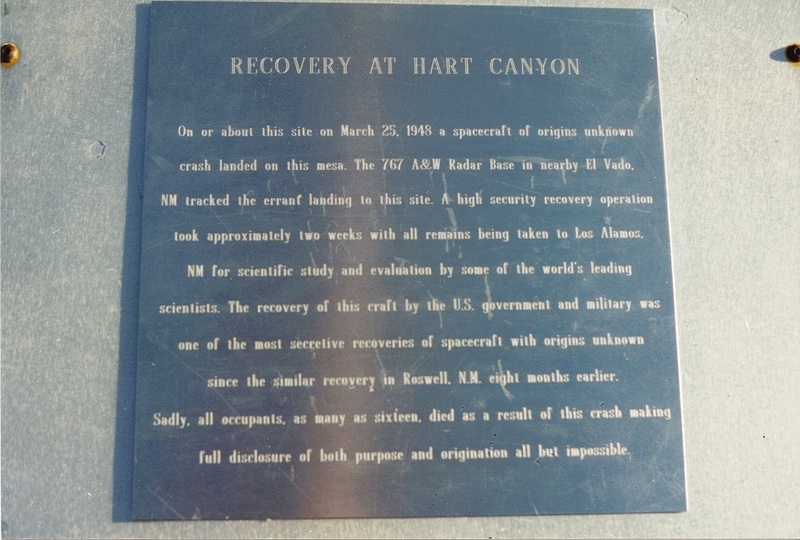 Any mention of the reported UFO crash at Hart Canyon, Aztec, New Mexico in March 1948 is guaranteed to provoke controversy, primarily because the affair (or non-affair, depending on your own, personal perspective!) generally polarizes people into two camps: those who believe the event actually occurred, and those who conclude everything can pretty much be explained via hoaxing, folklore and the actions of a certain Silas Newton. You can find out more about Newton and his antics by checking out his FBI file at the Bureau's Vault site right here. "Silas Newton (1887-1972) was a wealthy oil producer and con-man who claimed that he had a gadget that could detect minerals and oil. 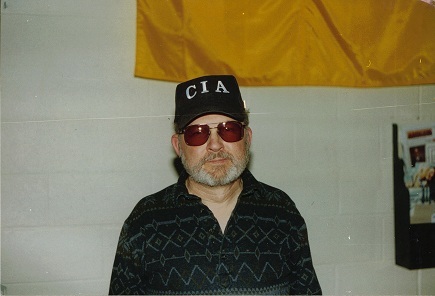 He was cited as an authority in Frank Scully’s book Behind the Flying Saucers, a work that claimed to report on several UFO crashes in the area of New Mexico. In 1950, Newton said that a flying saucer crashed on land he leased in the Mojave Desert; however, he revised his claim in 1952, saying he never saw a flying saucer but had only repeated comments he heard from others. These files detail the FBI’s investigations into Newton’s fraudulent activities between 1951 and 1970." One of the most controversial and bizarre aspects of the Aztec affair erupted in the late 1990s when UFO researcher and Aztec skeptic Karl Pflock (pictured above in his CIA hat, taken by me in 2002) claimed to have been shown certain entries from a journal that Newton had allegedly written (possibly around 1970-71) and which asserted something very weird. Namely, that elements of a secret group in the U.S. Government had visited Newton, and told him they knew the Aztec story was nothing more than a money-making scam, but, incredibly, they wanted him to keep telling the tale to anyone who would listen. Of course, this has led to theories that, perhaps, the government wanted to actively encourage the spreading of spurious UFO crash stories to protect (and confuse) the truth concerning real recovered saucers. Whatever the truth of the affair, it's an aspect of Aztec that came to a halt with Karl's tragic passing in 2006. But, it might not have been that way had Karl lived. I first met Karl in 2002 (although we had emailed, faxed, chatted on the phone and exchanged letters on matters of an Aztec nature as far back as 1998), and after discussing Aztec over the course of a couple of months, we decided to write a book together on the case, to be titled Silas the Magnificent, and that would tell the wild and controversial life of Newton, with the Aztec case taking center stage. We got as far as doing a fair amount of research, a bit of writing, and even submitting a synopsis for the book to various publishers. Of course, when Karl got sick this all came to a halt. But, Karl and I discussed the "Newton diary" angle extensively, and he told me the circumstances and story behind how he came to be exposed to it and its contents, the attempts he made to verify those contents, his thoughts on the matter, and a few other things besides. And, now, the Aztec story, the Newton journal, Karl's involvement in this admittedly odd, cloak-and-dagger-type situation, and the whole cosmic controversy are in the news again - as you will see from this new post from Kevin Randle at his A Different Perspective blog. 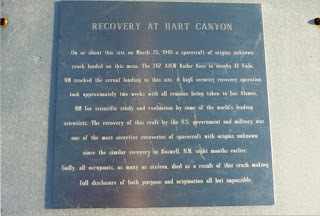 PS: The photo above was taken by me at Hart Canyon eight or nine years ago and demonstrates how, just as is the case at Roswell, the people of Aztec have embraced and highlighted their crashed UFO legend. Are you planning on finishing the book sometime in the future? No. Since we planned the book, there has been a lot of commentary, documentaries, papers, and another book on Aztec, and I think there's not enough I could add - 10 years after me and Karl planned the book - that would be substantially new and unseen that would make it worthwhile. NO one has ever investigated the crash that Keyhoe mentioned in one of his books and that the President of a Radio Network referred to. Crash happened in Montana around 1953. I contacted the editors of the nearest newspaper to the town and they told me they'd never heard of it and that they would have to look in their files. Last I ever heard of it, but it is in the beginning of one of the chapters in one of Keyhoe's books. I have never seen anything about this in any crash listing book including Kevin Randle's Crashed book and I don't think UFO researchers are aware of it.